Office Box Collection app: insight & download. Looking for top hidden object games? Well you are about to play one of our best and newest hidden object games with 300 levels. 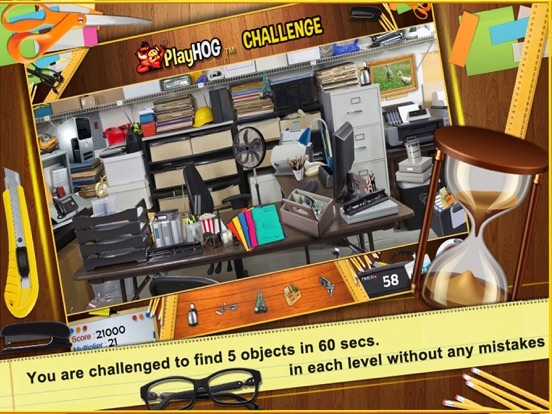 PlayHOG presents Office Box Collection, one of our newer hidden objects games where you are tasked to find 5 hidden objects in 60 secs. Your score is tied with a multiplier that increases as you find the right hidden objects, but beware, make a mistake and it reset to 1. Try to get the highest score as you try to find all 1500 hidden objects in one of the best hidden objects games. In Office Box Collection, you are competing for the best score on the leader board. As you play this game you will find that finding the right objects will increase your multiplier and help you achieve the top score. However, any mistake will reset this multiplier to 1, no matter how high you managed to get the multiplier. So if you want to get a high score in Office Box Collection you will have to play very carefully. All our new free hidden object games are 100% Free. You never have to pay anything, in fact we do not even have any in app purchases. 5 July 2018 : Free! 1 April 2017 : Free!